Log into Sportsthread.com, and click "Self Promotion Process" located in the menu in the top right hand corner of the screen. Once you do that, click step #2 to start building your mailing lists to college coaches. It is time to create the list of schools you want to play for. On Sports Thread you can make customized mailing lists of college coaches you want to promote yourself to. Why 30 Schools? Because you better believe each school is looking at AT LEAST 30 athletes. Don't know 30 colleges you're interested in? Click the link provided below to get started finding new opportunities. 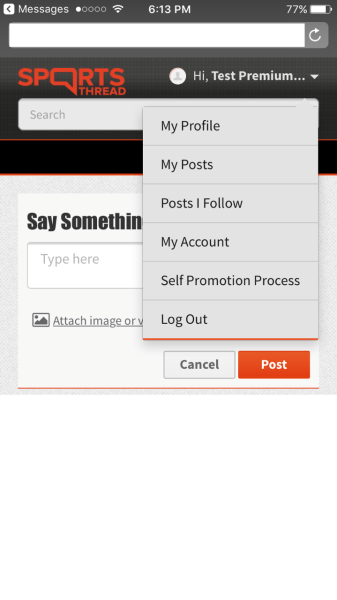 Example- Sportsthread.com on your smartphone- click your name in the top right hand corner, then click "Self Promotion Process"
Example: Sportsthread.com on your computer - click your name in the top right hand corner, then click "Self Promotion Process"